There are a lot of skyscrapers in Tokyo, its’s a big city far from natural. There are, however, still many places you can feel the nature in Tokyo. One of them is Jindaiji! Jindaiji is a historic temple in Chofu, Tokyo. It is said that the name of Jindaiji came from the god of water Jinja Daio. As the name shows, there are several spots where water is springing out around it. The Fudo no Taki is a natural spring selected as one of the best 57 spring waters in Tokyo. Jindaiji soba, which is made using this spring water, is a specialty in Jindaiji. 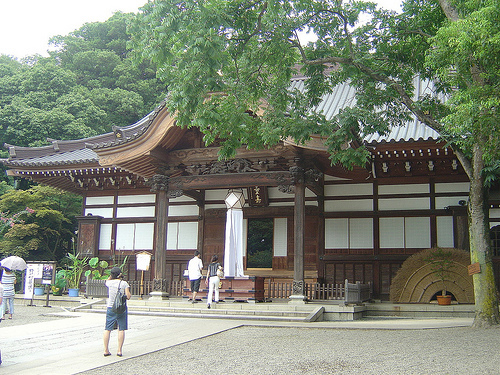 The temperature around Jindaiji often is lower than the outside area because it is surrounded by a lot of trees. Especially when it’s sunny, the temperature will lower by about 2 degrees than that of downtown. It is a summer resort in muggy Tokyo, so is especially crowded in summer. Bon odori (the bon dance) is held there in July every year and is very popular as it’s an outstanding location in the forest. 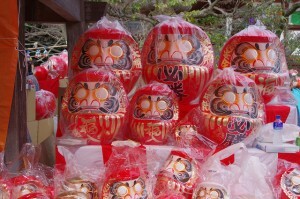 The most crowded event through the year in Jindaiji is Daruma ichi (Daruma Market) held in March 3 and 4 every year. 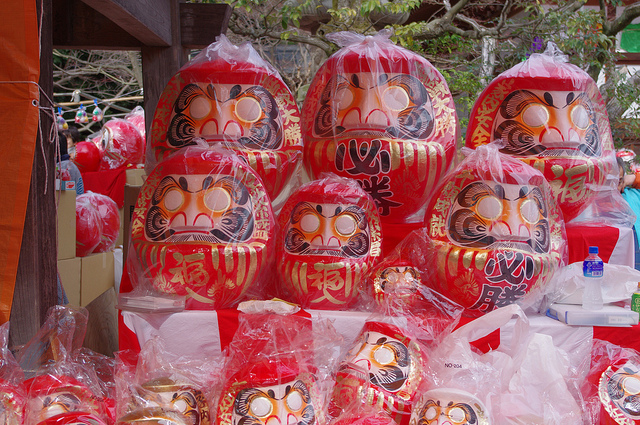 Usually Daruma ichi is held in the New Year, so the Jindaiji’s Daruma ichi in March is known as the last one calling spring in the Kanto region. There stand a lot of Daruma shops and street stalls in the precincts and along the approach to Jindaiji, so it looks quite different from the usual. The place where you should drop in when you come to Jindaiji is Kitarochaya. It is located on the approach to Jindaiji and it looks somewhat weird and happy with the yokai (ghosts) standing in front of it. This is a coffee shop made by using a famous yokai cartoon “Ge Ge Ge no Kitaro” as a motif. 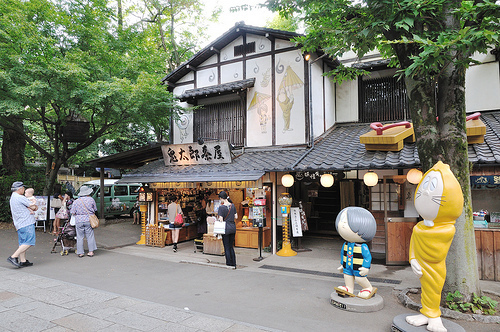 Because the auther of that cartoon Shigeru Mizuki had once lived in Chofu for more than 50 years and it is said to be his second home, the shop was built in Jindaiji, Chofu in 2003. The ghosts welcoming us in front of the shop are the cartoon characters. There are also many characters hiding in the roof and walls, so it will be fun to look for them! The shop is two-storied and there is a souvenir shop on the first floor and deals a lot of Ge Ge Ge no Kitaro goods in it. 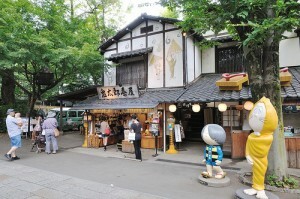 Next to it is the coffee shop and there you can eat foods made by using Ge Ge Ge no Kitaro as a motif. 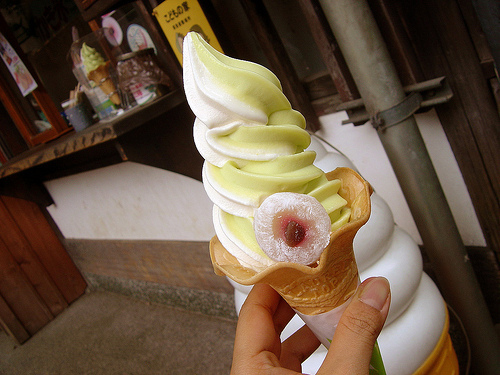 The most recommended one among them is a soft ice cream with a rice cake which looks like an eye on it! It is made by using Medamaoyaji that is the father of the main character Kitaro and looks like an eye as a motif. It is delicious as the rice cake with anko in it matches with rich soft ice cream! There is a deck you can rest and a yokai gallery where precious material and so on of Ge Ge Ge no Kitaro are displayed on the second floor. Be sure to go there when you visit Jindaiji!